My wife and I have been interested in adopting a child (or children) for several years. With two grown children my wife, Brenda, still very much yearned to again mother small children and nurture them into adults. We have kept foster children on and off over the past 21 years and even looked into trying to adopt some of those, however, it never worked out. (Dealing with the state CPS, foster care, and judicial system is topic in itself which we will not elaborate on now...though there is very much we could say). We always dreamed of possibly getting a child through private adoption, but the potential expense was too much for us to consider until the last few years. It wasn't until 2017 that we thought we may be able to come up with the finances to seek a private adoption. It's a sad shame that in the US one can abort a child for $400 or less (and few or no questions asked), but to adopt one the cost can be 50 to 100 times that!. Early in 2017 Brenda contacted an adoption facilitation organization in California and got us on the list of potential "Adoptive Parents." The company would send us profiles of "birth-mothers" who wish to give up their baby for adoption. As our child preference we indicated a girl that is mostly or all Caucasian, but we also would take a boy...or even one each. After a few weeks Brenda found a birth mom she was very interested in, in Oklahoma, but when she asked about her, the adoption people said she had already been matched with another couple. Well, Brenda didn't give up and prayed, prayed, and prayed for the Lord to bring us a baby, even the baby of the already matched birth mother, if it is His will. A few weeks passed and no other suitable mother came about. In the adoption arena many of the mothers are homeless and often drug addicted. Also, the mothers usually have had no prenatal care. We knew we would not be able to adequately care for a heavily drug addicted child, though we would consider a slight addiction. Then one day a call came from the facilitator that the mother from Oklahoma Brenda liked was available again. She did not get along well with her previously matched couple and wanted another. Brenda received her phone number and she and the mother "hit it off" from the start. The mother said she had three older children in foster care and another boy she adopted out the previous year, and she knew she couldn't take care of this coming little girl. The mother even said she would come and stay with us and have the baby in WV! Brenda was on cloud-nine. Everything seemed to be falling in place and the Lord was answering her prayers. But as some of you may know, the Lord often doesn't answer prayer in the way one expects. Sometimes the answer may come in an entirely unexpected way. Brenda went to Oklahoma City to meet the mother (we'll call her BM1) and bring her back home. We were wondering if she would actually come, but she did. Once here things were okay for a few days then the situation began to deteriorate. The birth-mother seemed to be constantly texting on her phone to the baby's father, and they were talking of getting back together, and after only a week the mother was determined to go back to Oklahoma. She said we could still have the baby, but she must go back and we had to pay for all her expenses while she was there. That is one of the requirements of adoption. The parents must pay reasonable expenses such as rent, utilities, phone, food, etc., not only until the birth, but up to two months afterward. Each state has its own laws, but generally that is the case. We put the birth-mother on a bus back to Oklahoma and we payed her expenses, even expenses beyond what we should pay. At her insistence we even payed back rent and past bills. The child's birth was still about three months away, so we were in it for the "long haul." Eventually, the mother became even more demanding for money. Wanting us to pay for all sorts of things. This was a very stressful time for us and especially, Brenda. The "drama" was intense. In the meanwhile we had to "retain" an adoption attorney in Oklahoma and pay a substantial sum just to get the legal proceedings started. After several weeks of unreasonable demands and Brenda being stressed out of her wits, we finally put our foot down and said we could not pay for all these unnecessary, extravagant expenses. The mother replied with her usual response, "You don't care about the baby or you would pay it." We said we would pay reasonable and actual expenses and no more. A day or so later we got a call from the facilitator saying that the mother dropped us as adoptive parents and wanted someone else. In most states the birth mothers have that right. They can change their mind for any reason right up to and even after birth. In some cases they can even change their mind after the child has been placed! Brenda was heart-broken. Her longed-for and prayed for daughter from this mother was not to be...but she was still confident the Lord was going to give us a child. Even our dwindling finances did not hinder her confidence. By then the baby's due date was only a few weeks away and the facilitator provided birth-mother 1 some other adoptive parents. We found out later that in a one month period the newly matched parents paid nearly $10,000 to BM1. After receiving all this money from us and the next couple, when the baby was about to be born the mother fled to a nearby state (so the Oklahoma CPS could not find her) and had the baby there. Then she told the newly matched parents bluntly, "Sorry, but I am keeping the baby. Good bye." From the very beginning birth-mother 1 had no intention of giving her baby up. She just used the adoption process as a means to fraudulently gain income. Unfortunately, this is a pretty common practice anymore, and there is very little prospective parents can do to protect themselves from the emotional and financial pain. So we made arrangements to go to Oakland, California about a week before the baby's due date and hopefully bring back our daughter. We took everything we needed to bring her back with us, even frozen breast milk someone had donated to us. Once we got there the mother was still insisting the baby was not hers, but ours. She referred to her as "your baby." She said she would stay with us in our extended stay motel until she was to ready deliver, but also said she couldn't come for a few days. In the meanwhile Brenda and I drove around the Pacific Coast, San Fransisco, Golden Gate Bridge, etc., to pass the time. After a few days, birth-mother 2 still didn't show up. She did call wanting her expenses for Sept. paid, and we paid them, but she was still elusive. A couple days later I needed to come back home for work and other things, but Brenda was going to stay until the baby was born. birth-mother 2 said Brenda could be with her for the delivery. I left for home on a Thursday morning (it was very hard to leave Brenda there. We were both in tears), and the next day Brenda got a stunning text from BM2. It contained a photo of her and the baby stating, "I have something of yours" (the baby). She continued, "I am in the hospital and already had the baby. I am about to be released but the police are after me. If you will send me some money to buy some gas, as soon as I get out of here I will have a friend bring me and the baby to you. I will stay until morning and sign the papers before a notary then I'll be gone." Brenda was very excited and replied "Okay" and quickly sent her $50 by Western Union. When it was picked up she texted birth-mother 2 back asking when she was coming, the mother asked for the motel address and then replied "I'm on my way." Brenda called me ecstatic. She said, "SHE HAD THE BABY...SHE HAD THE BABY...AND SHE IS BRINGING IT TO ME TONIGHT!!!" Brenda was so excited and I wished I was there to share in her joy. Brenda got out the little baby clothes she had been collecting for months and laid them neatly on the bed. She thawed a package of the breast milk we had so carefully taken out there, and then Brenda waited anxiously on the motel balcony, watching for the car with her precious and longed for baby to arrive. It took about an hour to get from Modesto to where we were staying, and by that time Brenda was intensely watching every car that pulled in. She was talking to me on the phone and updating me on what she saw: a red car with two people; a white car with one; an SUV with two children; etc., but no car with an infant. One hour passed; then two hours; and finally after the third hour of standing out in the chilly night air, the cold realization set in that the little baby was not coming. Brenda tried calling and texting birth-mother 2 repeatedly with no answer. Eventually the calls went straight to voicemail. We then grudgingly admitted to ourselves we may have been taken in by another heartless scam. I had never felt so sorry for Brenda in all my life, and I ached to be with her during this terrible time. She was alone and 2500 miles away from home on one of the hardest days of her life. This was a difficult and trying time for both of us. I went outside and laid prostrate on the grass and begged the Lord to bring that baby to Brenda. That was one of the most earnest and sincere petitions I had ever made to the Lord. When I talked to Brenda a few minutes later (it was early in the morning by then) I asked what she was doing. She told me she went inside and sadly picked up the little clothes she laid out so carefully and placed them in the foldable "co-sleeper" she brought which was also on the bed. She positioned the clothes just like a little baby was in them and then she laid on the bed with her arm around the sleeper wishing so much a baby was in there...and sorely wept. What a terrible, terrible night. The next morning we were both exhausted and felt like our child had been abducted. We didn't know where she or her mother was. We wondered if she may have wrecked on the way, had some other trouble, or maybe even been arrested. Brenda called the Modesto police and told them the story and they yawned and basically said they couldn't care less. Brenda told them the mother had violated parole and they looked it up and saw where she was in violation but still didn't care. One officer made the remark that "half the people in Modesto have violated parole, and unless she does something violent, no one here is going to take much interest in her." Brenda kept emphasizing the baby may be in harm's way, but it all pretty much fell on deaf ears. Brenda stayed another week and even went to Modesto showing a photo of the birth mother at some cheap motels hoping someone had seen her, but no one had. Finally she got on a plane and came home, alone, without a baby. A couple weeks later I wrote a letter to the county district attorney trying to shame them into looking into this matter, and it must have somewhat worked because they put a sergeant on the case to check it out. He called Brenda and got the story and then went to the birth mother's mother's house and found her and the baby. She was arrested for drug possession and several other charges plus the parole violation. She is still in jail (as of December 2017). The baby went to CPS and then foster care. The CA CPS would not even talk to us about it. The sergeant called back a few weeks later and said he learned the birth mother was scamming other adoptive parents the same time she was scamming us. Brenda and I may live somewhat sheltered lives, but we had trouble believing that a person's heart can be so cold and cruel to do what she did to Brenda for $50. If the birth-mother had said she changed her mind and decided to keep the baby, that would have hurt, but at least we would have known what was happening. Instead the BM, in one last effort to get a little more money, enticed Brenda by saying she was bringing her the baby, and then after she got the $50 there was nothing but silence. Has this birth-mother never felt emotional pain? Does she not know the torment of not knowing what is happening to someone one loves? Brenda loved that baby dearly without ever seeing her. Whether the birth-mother has felt this kind of pain or not, why would she want to inflict it on others? Yes, it was probably a drug fueled action, but still, how can people be so needlessly cruel? Once Brenda came back home we both had to take a break from actively pursuing an adoption because our hearts couldn't take much more for a while. A couple more birth mothers were presented, but they weren't right for us. In November Brenda was contacted by an attorney representing a homeless couple who was about to give birth. Brenda agreed to talk to them and they liked her and wanted to give us their baby. The attorney essentially guaranteed us the baby and then sent some papers. He wanted us to come to CA and bring $22,000 just to start. That was just his fee. We still had to pay the couple's expenses. One will learn quickly in the adoption arena that no one is allowed to "make" any money in an adoption except attorneys, "adoption agencies," or "adoption facilitators". The birth parents cannot be paid anything above normal living expenses else it is deemed "child-trafficking." Yet the attorneys can "make" as much as they want to bring people together and do the legal work, and there can be a significant difference in their "fees." Some attorneys seem to be genuinely concerned about mothers and children (some have adopted children themselves), but others seem to be mainly concerned about the money. Whether they work with a mother for months or just a few weeks, they charge the same high fees regardless. We were fortunate to work with good and reasonable lawyers, but there are horror stories we have heard from others of attorneys pocketing some of the money that was to go to the birth-mother's expenses, etc. Anyone who is interested in adopting, do some research on attorneys. It will pay in the long run. Since the homeless birth mother had not had any prenatal care, and the birth father was classified as "schizophrenic," plus we didn't have $22,000 to put towards it, we had to decline. Things were looking pretty bleak a week before Thanksgiving 2017. Nevertheless, Brenda didn't give up. She was a little depressed and somewhat discouraged, but she didn't give up, and those of you who followed her Facebook posts know she was regularly requesting prayer for her "Christmas miracle"...and she was convinced it was going happen. Right before Thanksgiving, 2017, the Lord began to show us how He was going to bring Brenda's "miracle" about. Remember BM1, the one who had no intention of giving up her baby and used her pregnancy to string us along and get us to support her? Well, she has something that every other person hasa conscienceand as long as a person does not harden or sear his conscience, the Lord will use it. About a month after her baby was born birth-mother 1 "broke the ice" and wrote Brenda and told her she was sorry for what she put us through and that she hoped we would get the baby of birth-mother 2 (that was when the birth-mother 2 situation was still going on). She said she liked us and the reason she dropped us was because she could not bear to take any more of our money knowing she was going to keep the baby. She asked Brenda to forgive her and of course Brenda did. Though Brenda was very hurt and stressed over the whole ordeal, she could not hold a grudge and told birth-mother 1 she still loved her and had no ill feelings towards her. She knew the mother was just doing whatever she could to keep her baby and keep it out of foster care. While talking to birth-mother 1 over the following weeks Brenda learned she had a sister and this sister was currently pregnant. After a few months of pregnancy the sister realized she could not care for the baby as it would need nor provide her a safe home, so she contacted an adoption facilitator and was matched with a couple from VA. That was about all we knew until a few days before Thanksgiving when birth-mother 1 called Brenda and told her her sister was very unhappy with the adoptive parents she was matched with. She said the potential adoptive parents were cold and uncaring, hardly ever called to check on her, didn't seem concerned about her or the baby much at all. Plus, they refused to talk to the child's father, treating him like an outcast. The birth mother seemed to feel she was just a nameless servant who only existed to provide these people with a baby. Furthermore, the adoptive parents did not keep their obligations of paying the birth-mother's expenses because she was nearly evicted from her apartment, had her electricity turned off, phone disconnected, and other stressful financial things an eight month pregnant woman should not have to deal with. birth-mother 1 then told her sister she needed to drop that rude and arrogant couple and select Brenda and me as the adoptive parents! birth-mother 1 told her sister, "After all that I did to them and put them through with my baby, they forgave me and are still friends with me." birth-mother 1 also told her sister she had stayed with us and saw where we lived, and it was a beautiful farm. Her sister then told BM1, "Those are the kind of people I want to have my baby. Have Brenda call me." Brenda called and talked with the sister for a long time and found her to be a kind, considerate, and soft-spoken young woman. She was not demanding and dearly cared about the baby she was carrying. She had went to all her prenatal doctor visits, did not smoke or drink, was not on drugs, took all her vitamins, and took the best care of herself and the baby she could. She was the perfect birth mother; the kind of birth mother adoptive parents dream about but almost never find! We will call her BM*. BM* hesitated to separate from the previous adoptive parents but felt she must because of their uncaring and cold attitude. She did not want her baby raised in such an environment. After talking some more BM* told Brenda she wanted us to be the baby's parents and would sign a power-of-attorney stating so! Plus, the baby was due in only 3 weeks! Brenda was elated, but I was cautious. I did not want to see her go through the pain of loosing a child again. Think for a moment, dear reader, about how hard it would be for a mother who loves her children to give one or more up to adoption. Those of you who have children, could you do it? What if you lived in a terrible situation and don't see how you can keep the child safe? Yes, there are cold and heartless or drug addicted birth mothers out there who will abort their children or give them up to about anyone just to get rid of them, but some mothers very much care and are greatly torn about what is best to do or to who to give their child. They may have other children which they can barely support and know another child would be impossible. They may have violent boyfriends or other family members they cannot trust with children and see adoption as the only alternative. I greatly admire these mothers who instead of taking the "easy way out" and aborting (killing) the child, endure nine months of struggle and "inconvenience" so the child can live with someone else and have a life. They have great courage, much more than many men I have known, and I hold them in very high esteem. Some of you may wrongly think, "I would never let myself get in a situation where I could loose my children or consider giving one up for adoption." You better watch out. The Lord may try you out sometime and "put you through the mill." Many of us are guilty of taking credit for the blessings the Lord has granted to us. We think things are going well because we are responsible, smart, sensible, hard worker, etc. Those things have their place, but tragedy and "hard times" can strike at any moment like they did with Job. Consider this scenario, A young woman without a care in the world gets her drivers license and first car and is out running around and gets a traffic violation and must go to court. The fine is several hundred dollars and she doesn't have the money, so being naive and "dumb" she doesn't show up for court. Little does she know that the court will put out a bench warrant for her arrest. Several years pass and the young woman has had three or four kids by then, her boyfriend has left them all, but she is getting by. She loves and cares for her kids and they love her. One day she is out driving to the store to get some milk completely unaware in her busy life that her car's license has expired. She gets pulled over by the police and he checks her drivers license...and you can guess the rest. That old forgotten ticket from years past comes back to haunt her and she is arrested. What happens to the kids? They end up in CPS (Child Protective Services) and if the mother doesn't have the money to post bond or a near family member to take the kids, the kids will end up in foster care, and the nightmare begins. There are a hundred other similar scenarios that could bring about a similar result. One thing I have learned over the years is never take credit for the grace and blessing of God. No matter how "responsible" and "well off" you think you are by your own effort and "brains," all your blessings come from the Lord if you are a believer (and even an unbeliever). After hearing the birth-mother and her boyfriend (the birth-father) would sign, we contacted an attorney and had the papers drawn up. The attorney called BM* and said she sounded very sweet and settled on giving us the baby. She made an appointment to get the papers signed...AND THEY BOTH SIGNED! That was only the first step or hurdle we had to cross, but it was a big one. States vary on the requirements to adopt. Some are relatively lax on stipulations while others, like Oklahoma, are pretty strict and comprehensive. In Oklahoma we had to hire a lawyer to represent the birth mother, a counselor to counsel the birth mother, plus the attorney to represent us. It is a very involved and costly process all used to protect the birth mother from coercion, pressure, and child-trafficking. Plus there is a very detailed interstate process required when adoption occurs across state lines called ICPC (Interstate Child Placement Compact). It would have been much simpler if the birth and adoption would have occurred here in WV, but that was not to be. After the power of attorney was signed we decided we needed to go to Oklahoma and get to know the birth parents and prepare for the baby's birth. We packed our car with loads of "baby stuff", I took FMLA off from work, and off we went to Tulsa. While on the way we were emailing our attorney and she said there was a problem with our "home study" paperwork, I went, "Oh no...problems are starting and we are no longer in WV to straighten them out." Our home study was fine for California a couple months earlier but Oklahoma requires more documentation which we didn't have with us. While on the way (Brenda texting) and at the motel we were able to get everything straightened out with the help of a very kind, helpful, and considerate person here in WV. I won't mention her name, but without her things would have been much more difficult or maybe not even possible without the work she did back here in WV. One thing courts require is the proper paperwork and if their lust for "documentation" is not satisfied, they can stop everything regardless what the birth mother wants. But thank the Lord in all His goodness, He led us to the right people to get it all straightened out. Once we got to Tulsa, Brenda took the birth mother to a doctor's appointment the next day. The ultrasound showed the baby as healthy and everything was perfect. The doctor said he would induce labor the next Tuesday (Dec. 5) because the baby was getting pretty big and she was in her last week. In the meanwhile we took the birth parents out to eat, went to a museum one evening, looked at Christmas lights, ate pizza, bought them some groceries, etc. and generally got to know them and they us. The mother is one of the sweetest and considerate young ladies we have met. She seemed to like us as well and never wavered on giving us the baby. Come Tuesday we were all at the hospital at 7:30am ready for her to be induced. Since she has had a several previous pregnancies with five living children everyone thought it would be a pretty easy delivery, even the doctor. It was not. After about 12 hours she began to deliver. Brenda was in the delivery room and I stood at the door behind a curtain and heard all that was going on. That poor girl had a very hard time giving birth, and I felt very sorry for her. After she was in labor for quite a while the doctor finally got a hold of little Madison and tried to help her out. A couple more very hard "pushes" by the mother and she was born, bruised and battered from the delivery, but she was born. Madison was alert and looking around at everything before the nurses even wiped her off. Then we had another hurdle to cross. Do We Get Her To Ourselves? As mentioned earlier a birth mother can change her mind at any time. The power of attorney we had was in force, but it could be revoked in a moment with another signature. We were hoping the mother would not object to us taking the infant to another room so we could "bond" with her. The mother agreed to this earlier, but one never knows what may happen after the birth. So we were anxious. Once Madison was weighed, the nurses said we will now take her to the other room where she and Brenda can do "skin-to-skin," and that they did. The birth mother didn't object. Actually, she never asked to see the baby. She knew it would only make things harder. Brenda was ecstatic and crying telling Madison how much we love her. While doing the skin-to-skin Brenda couldn't stop kissing her and hugging her. I have never seen Brenda so happy and filled with such joy. Finally, she could be the mother of a little, helpless infant again, and that realization had her bubbling over with gratitude. It was an experience to cherish for both of us. After an hour of snuggling something we dreaded occurred. The birth mother's family came in for the birth and they barged in our room wanting to see the baby. There was 5 or 6 of them and at least one was drunk. The birth mother's mother came up to Brenda without asking and took Madison out of her arms and carried her to a chair to hold her. Keep in mind this woman lost some of her own children years earlier because of neglect and came to the hospital with a drunk "boyfriend." This was a touchy situation. We as adoptive parents had to tread a fine line because the grandmother could put a lot of pressure on her daughter to keep the baby or even try to get Madison herself. But guess who rescued us? It was BM1, the birth mother's sister who kept her baby. She told her mother to be good to us because we forgave her for all she did to us and then told her mom in no uncertain terms that Madison was ours. She also said that if she has anymore children she was giving them to us, and she also wanted us to have her children that were presently in foster care! Isn't it amazing how the Lord works? He can use the most unlikely people and situations to change circumstances and bless His people in ways that are hard to imagine! The grandmother held Madison a few minutes longer and then gave her back to Brenda and wished us well. The birth mother's brother who was also there told me "Congratulations," and then they all left...much to our relief. The grandmother's drunk boyfriend was really something else. Before they all went home the birth-mother saw him rifling through her purse while she was still on the birth bed recovering and was powerless to stop him. We had given her a $200 gift card for food and other expenses the day before, but when she was able to later check her purse, it was gone. That was all the money she had...so we got her another card. Our first night in the hospital with Madison was not without more drama. The birth father started saying he was going to steal Madison and take her away. He would disappear from the hospital for a while and return spouting more threatening things. He had us, the nurses, and the poor birth mother stressed out. We were given another room farther away from theirs and we stayed put hoping he could not find us. We were told he was walking the halls looking for Madison and saying all kinds of strange, conspiratorial things. He even said the only reason we wanted Madison was so we could use her social security number to help us become American citizens! Apparently he did not think in his drug fueled state that people born in WV are already US citizens. The next day the birth father regained his senses (or laid off the drugs) and the threats pretty much ceased. Can We Get Her To Ourselves? The next hurdle for us was were we going to be able to get Madison out of the hospital and to our motel room before something else happened or someone changed their mind. Little Madison had to stay another night because of elevated bilirubin levels (jaundice), and the birth mother was still recovering there as well. No one knew our motel room or even motel location and we figured if we could get Madison there, the temptation of the birth father or anyone else to see or take here would be lessened. It was kind of a "out of sight, out of mind" idea. Also, just getting Madison alone with us would be a great relief. After the second night the doctor released Madison and we went to our temporary home at the motel. The drama continued our first night at the motel, not from anyone in Oklahoma, but from an unexpected source. That evening Brenda got a text from an unknown phone number that accused us of "stealing" a baby. First, the text demanded we tell them where the birth mother was as well as the baby if it was already born. Brenda asked, "Who is this," but they would not say. They continued asking about the birth-mother stating how "no one can find her." Then they accused us of stealing their baby. We then realized these anonymous texts were from the previous adoptive parents the birth mother dropped a few weeks earlier. They had no way of knowing we had Madison, or even her name, but they assumed we did from information they received from the birth Mother's adoption facilitator. Brenda did not reply to the texts but the they kept coming and were more threatening and menacing each time. They said they were going to sue us as well as everyone else involved, and then they said don't try to block us because "we know who you are and where you live." We contacted our attorney and told her of all this and she reassured us that the birth mother can change her mind at any time for any reason and didn't have to tell the previous parents anything other than what she already had. However, these previous parents were not going to take their loss quietly. We know the pain of not getting an expected baby two times over, and it hurts, but the attitude of these people showed us very clearly why the birth mother no longer wanted them. They were harsh, bitter, vindictive, and liars. They not only threatened us, but also their facilitator, attorney, and everyone else involved. They were caught up in several lies by pretending to know more than they did. Everyone involved was very glad that Madison did not go to these "psychotic" people. The attorney said not only did we save Madison from a possibly terrible life in Oklahoma, we saved her from these selfish, hateful, and bitter people. The next huddle we had to cross was the birth Mother's actual relinquishment of her parental rights to Madison. In Oklahoma a birth mother must relinquish her rights before a judge. There was no judge available in Tulsa so she had to go two hours away in Oklahoma City to find one who could hear her in a reasonable time. The attorney made arrangements to pick the birth-mother up the night before and take her to a motel in Oklahoma City. We wanted to make the experience as easy and pleasant as possible. The day came for her to be picked up and she suddenly said she wasn't going to go...without her boyfriend. Only she needed to go, not the birth father, but she insisted he go also and we, of course, consented. The driver that was to pick them up almost refused because she heard of the birth father's behavior in the hospital and was afraid. Nevertheless, when the attorney told her how urgent the situation was, she agreed. Brenda and I were praying every step of the way; that they would get in the car to go; that they would stay the night; that she would get up to go to the courthouse the next morning; and that she would actually relinquish before the judge. The next morning I was pacing the floor waiting for news. The attorney said she would text us the moment she relinquished. Brenda was confident and said, "She'll do it," but I was still apprehensive. We had had so many disappointments over the past year and I knew if this fell through we would both be devastated. With the past failures we never actually had a baby in our arms, but now we did, and to have to give little Madison back to the birth parents...or someone else...would be a terrible, heart breaking ordeal. Around 10am Brenda got a text that only had two words, "She relinquished." Brenda and I looked at each other with misty eyes and then quietly hugged in the middle of that messy motel room. All the while little Madison was lying on the bed gazing around the room with her beautiful blue eyes. One of our biggest hurdles was crossed, with just one more yet to go. Our final hurdle before we could take Madison home to WV was to clear with the Interstate Compact offices in both states. The attorney had to prepare a huge amount of paperwork, in triplicate, to present to each office. It included our home study, background checks, personal references, court documents, etc., etc. If for some reason it was not approved, we could not leave Oklahoma with Madison. Having been foster parents for years we knew how demanding and particular state agencies can be with documentation. If it is not perfect, it can be rejected and may take weeks to get it straightened out. For instance, when I had to do my finger print background check for our home study, because I have a missing finger, it fouled the electronic scanner up so that it rejected my prints three times. I would do the finger print scan, they would sent it off, and in three or four weeks the results came back "rejected" because of a faulty scan. Then I did it again with another person, a few weeks later it came back again, "rejected." Finally, they decided to do the old fashioned ink and card finger print method, and when the results came back that time I was finally cleared. The whole process took about four months. We were praying there would not be a similar hold up with our ICPC clearance...and thank the Lord, there wasn't. The attorney did an excellent job getting everything in order and it went through the Oklahoma office in a single day. Now all that was left was the WV clearance. They sent the papers to the WV office by next day air and we anxiously waited to hear that they cleared us as well, but most of the day passed and we heard nothing. I finally contacted the WV ICPC office just to see if they received the package, and much to our dismay they had not. The next morning the office said they still had not received it yet the tracking information said it had been delivered. The kind lady at the office said she would try to find it and a few minutes later she emailed, "I have it." We were relieved, but the best news came about thirty minutes later when we got an email stating that "The private adoption of (Madison Paige Morton) had been approved." Brenda and I were elated. We could finally bring Madison home. After the final approval, Brenda and I were packing suitcases with baby clothes, diapers, and everything else we brought. The unused frozen breast mill was put back in the cooler. Little Madison's new car seat was adjusted to fit her just right, and we all piled into the car for our 1000 mile trip home. We wondered how Madison would handle the long ride being only a little over a week old, but she didn't complain at all. Her new mother complained more than she did. The next day we pulled into our driveway and took Madison into her home. We were all three as happy as can be with our living, breathing, beautiful "Christmas Miracle." I have never seen Brenda as happy, content, and satisfied as she is being the mother of Madison. With the Lord's grace we were able to forgive BM1, and the Lord blessed us for it greatly. Unforgiveness is like a cancer that consumes the person harboring it, but our old proud nature does not like to forgive. It is not "natural" for him, thus the Bible must encourage us to forgive because those of us who have received the Lord Jesus Christ as our Savior have been forgiven by Him. Granted, being emotionally and financially defrauded as we were is by no means the most devastating acts that could occur to someone. Some have had to endure much greater harm by others, but even the smaller grudges can harbor huge consequences if one does not forgive. In our case forgiveness freed us from the burden or resentment, gave birth-mother 1 peace, gratitude, and favor with us, and in the end provided us a perfect child to adopt. Isn't the Lord very gracious and kind! This verse promises believers that if they ask the Lord for anything that is according to His will He will grant it. He may not grant it exactly when you think you need it or in the way you expect it, but He will answer it if His will allows it. The Scriptures also speak of persistence in prayer. There are several examples from Jacob wrestling with the Lord (Gen 32:22-31) to the blind man seeking his sight (Luke 18:35-43). Persistence seems to be a method the Lord uses so we can understand if what we ask for is really what we want or need. How many times do we pray for something a time or two and then forget it because it really wasn't very important to us? But if something is on our heart continually, then we will continually ask for it. If we got everything we wanted the first time we asked, it is hard to imagine what kind of mess we would be in. "Persistence demands patience, waiting. This is the ground of spiritual growth, spiritual vitality, and health! Because our natural inclination is to use God and not to love God, only frustrations in prayer can purge and purify our desires...Perhaps God desires to give you exactly what you have asked for, but only in a time and way that the gift can truly benefit you instead of harming you." In other prayers, one may be earnest and persistent in asking, but the Lord doesn't answer in the affirmative. These are apparently requests not according to His will. Paul's "Thorn in the Flesh" is a prime example. Possibly one reason Paul had the "thorn" was to record the denial in his epistle so we could learn that not all prayers are answered! 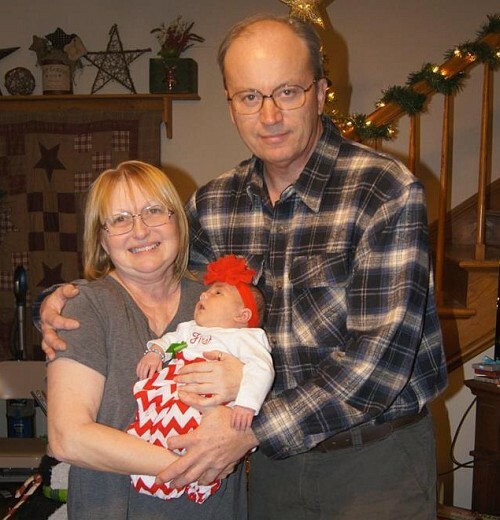 Nevertheless, God is a God who wants to answer prayer and He will if it supports His cause and it is in His children's best interest, and Brenda's persistent prayers for little Madison are a key example of the power of persistent prayer in action. Some of you may be asking, "You keep mentioning your wife, Brenda, praying for a child to adopt. Did you not pray for the same?" Frankly, most of the time I did not. I prayed for the Lord's will in the matter and if He wanted us to have a young child, that He would provide him or her to us, but I did not specifically and persistently pray for the Lord to give a child as Brenda did. Her prayers were the driving force; she knew what she wanted and entreated the Lord for it. As for me, I was not sure. We are not as young as we used to be and raising a child from birth, beginning while we are in our 50s, is a little scary for me, but Brenda has no reservations at all. Since the Lord has answered her prayers and given us Madison, all is settled. We will do the best we can while trusting the Lord to guide and provide for us. During the next few months of the Winter and Spring of 2018 we had Madison all to ourselves. She was not yet legally our daughter, but once the birth-mother relinquished her rights and we were approved to bring Madison home, it would have been very difficult for anyone to contest the adoption and take Madison from us...difficult but not impossible. There are horror stories in the adoption world of this happening; potential adoptive parents actually getting to take the child home as their own for weeks or months and then the birth-mother, birth-father, or even a blood relative contesting the adoption and getting the child back. This must be done by a court and it would involve expensive attorneys on both sides and is thus fairly rare, but it does happen. During these months of "limbo" we did not hear of any rumblings back in Oklahoma that could cause us a problem, and we were very thankful. The roller-coaster events of the previous year had stressed both of us and we greatly enjoyed the peace. Our attorney in Oklahoma told us we could petition for adoption of Madison after around four months. That would be in April, 2018. So we asked the attorney to get everything ready and get us a court date as soon as she could. Even though we did not suspect there would be any problems, we still wanted it completed for peace of mind's sake. For our part we had to have the social worker who prepared our home study prepare a "Post-Placement Report" just to verify Madison was developing well and doing good in our care. 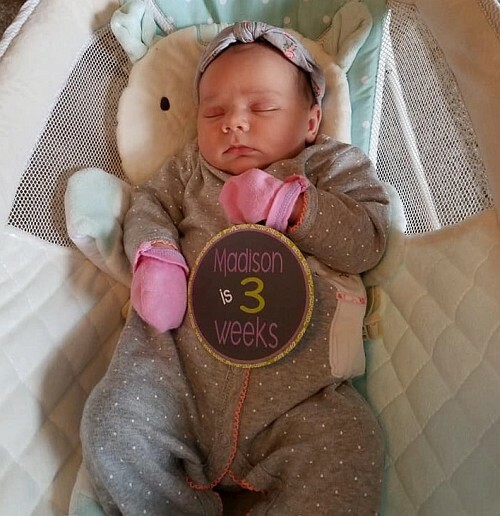 The social worker was very impressed with Madison and our love and care for her and gave us a positive report recommending that the placement be finalized. The first week of April we were all three on an airplane for Oklahoma City. We hoped Madison would not be too disturbed by the flights, and she wasn't. She slept most of the time and Brenda even got her some baby ear muffs to help with the noise. The next day was our court date and we both wondered what all would be involved. Is it a long ordeal or simple proceeding. It turned out to be the latter. The judge was a very nice man who when he saw Madison in her beautiful dress held up the proceedings and called his office staff in to ogle over her. The ladies all held her and bragged on her and then left. Our attorney told us before hand I will be asked very tough questions like, "Your name," "Where do you live," and "Are you willing to adopt this child as your own." While I was asked these difficult questions the judge gave Madison his gavel to play with. These adoption cases are likely a high point in the activities of a judge. They usually have to deal with divorcing couples, feuding families, difficult child custody decisions, and other negative matters and the happy time of an adoption finalization is a welcome relief. From the look of the faces of the people leaving the courtroom before us it appeared the cases involved tears, sorrow, and heartache, but when Madison went in the mood improved greatly. Once we walked out of the courtroom our attorney told us much to our relief, "No one can take her from you now." Then she went immediately to the clerks office and made for us five copies of the judges decree of adoption. Hallelujah! Our year and a half ordeal was finally over and Madison is now legally our daughter. While still in Oklahoma we contacted the birth-mother and asked her if she wanted to see Madison before we left. (We didn't tell anyone in Oklahoma we were coming ahead of time because we didn't want to create an opportunity for anyone to object to the finalization.) The birth-mother met us at the motel and tried to hold and play with Madison, but Madison had little to do with her. After a few minutes we had to leave for the airport and leave Oklahoma for the final time...we thought. Little did we know at the time what the rest of 2018 held for us.